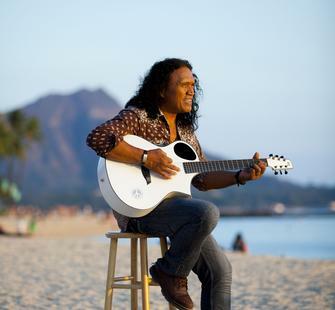 Sunday, March 24, 2019, 7 p.m.
Henry Kapono is a performer who has it all: he is a gifted vocalist, guitarist, songwriter, composer, and thrilling performer with a multitude of accolades to his name, including 14 Na Hoku Awards and a Grammy nomination. His original songs celebrate his love for his family, express his pride in his Hawaiian culture, and share his joy in his home in the Islands! Every Sunday, on the beaches of Waikiki, he fronts the rocking Dukes on Sunday band. This spring, he brings the act—and his glorious “Beach Boys paradise” sound—to the Montalvo stage. Special guest Johnny Valentine is a frequent collaborator and a celebrated performer in his own right, fronting several bands and launching the career of his nephew, superstar Bruno Mars.